Yesterday I was driving to Walgreen’s to pick up some prescriptions for my mom. Minding my own business, singing along to Sirius. I pulled into the drive-through bay and noticed three vehicles ahead of me, so I prepared to wait a while. Glancing around, I saw something on my front windshield — beady eyes, pointy nose, little-bitty hands, a whip-like tail. There he was, clinging fiercely to the dipped-in place where my windshield wipers were. I looked around, hoping to find some brave person to help me remove him. Or, failing that, a stick so I could shoo him off myself. I snapped his picture, of course, because otherwise, who’d believe me? I’m a writer, used to making up tall tales. When one car completed its order, the rest of us inched forward. About this time, Mickey went on the move. He scurried across my hood toward the driver’s side and suddenly, I realized he was out of sight. Knowing it soon would be my turn to place an order, and realizing that Mickey could very well slip into my car while the window was down, I peeled out of the drive-through, around the building, and into the parking lot. Shaking but trying to calm my heart rate, I climbed over the console and out the passenger-side door to safety. I looked for Mickey. I did. But he was nowhere to be seen. Not on my car anyway. Had I managed to sling him off? And when I texted my darling son Domer this photo, would you like to guess what he replied? And so are snakes. And tarantulas. And alligators…. This entry was posted in Uncategorized and tagged drive-through, fear, mouse. Bookmark the permalink. Sorry if I creeped you out so early in the morning — I know you’re NOT a fan of rodents! Why didn’t I think to shove him off with my umbrella?? Dumb! He’s probably running around the parking lot at Walgreen’s, wondering where his taxi went, ha! As for the Christmas suggestion, you know, that’s an excellent idea … and would serve Domer right!! Oh dear! I have to say, I do like his little face. Now, if it had been a nun on my car, I would have been terrified! Or maybe a big spider. Such things can be very off-putting when driving, you were very brave, Debbie! HaHa, I can imagine what you’d do if you went out to your car and found a nun sitting in the passenger seat! See? You do know the feeling. The entire way home, I was wondering if/when Mickey would drop down from who-knows-where right into my lap!! I can believe it! Hopefully you managed to shake him off, little bugger. Oh, I do hope so. Now if he’d offered some cash for his trip to town, that’d be another story! I don’t mind mice at all. HOWEVER, you should see how I scream when I see one of those HUGE black water bugs in my bathroom. OMG…I FREAK out! Hahahahahahaha! Anyway, I’m glad to hear that Mickey left. But I wonder where he went?!? Have a FAB Wednesday, my friend! Ron, you and Domer have that quirky sense of humor! You know, I never thought about a mouse hitch-hiking on my car. Snakes? Oh, my, yes, and the idea of one *inside* with me gives me the shivers! But a mouse? I thought they were more interested in food, and there’s none of that in my car, so if he’d hung around, he’d have starved to death! I don’t like those immense water bugs either. In fact, I still get the creepies when I remember making an insect collection as a kid and having to handle big beetles, yuck! Awww, he’s adorable :) But I”ll agree with you about spiders…eeeeeeeeeeeeekkkk! You, too, Morgan?? Gee, if I’d known so many of my friends found Mickey cute, I’d have gotten a better portrait of him, ha! At least it hadn’t made webs inside like one I encountered several years back — talk about a MESS!! Too funny!! Mickey on the surface isn’t nearly as scary as a great white, but I sure don’t want either on my car! OK. I’m weird, and I know it. My first response was sympathy — to think about how scared he was. My hypothesis is that some predator had picked him up, and then dropped him. It happens more often than you’d think. In any event, I hope he escaped safely, and that his heart rate is back to normal. For that matter, I hope your heart rate is back to normal! It’s a wild and woolly world out there, just full of surprises! Anyone who had a pet squirrel as a kid would, I suppose, have a fondness for mice as well, right? That’s okay. I might not appreciate rodents — especially those looking for a free ride — but this experience has taught me to be more careful. Who knows what critters are lurking about, just waiting for an outing to the pharmacy!! Well, and don’t forget — I was the one who had the rocker panels on my car eaten up by what everyone said probably was a rat. So: mousies, ok. Rats? No time for those at all! I didn’t remember that — no wonder you make a distinction between mousies and rats! See? There’s always a way to look on the bright side, Virginia! They can be cute. I’d never trust’em though… Thanks for the giggle, Debbie. Oh my, I think he is incredibly cute. Poor little thing. The only time rodents make me nervous is when they run and that is probably because they run so incredibly fast. My cats kill a lot of them outside, then bring them to me. I’m so lucky, I know, I know. I guess they think I could fry a couple up if times got hard, lol. If that had been a snake or large spider, I would probably have abandoned my car and never returned, lol! Well, Dallas has *never* brought me a mouse! Maybe that’s why I have a dog, not a cat. I know one should never say ‘never,’ but I can’t imagine fried mouse, hard times or no!! I wish I’d thought to shoo Mousie off when he was on the passenger side; at least then I knew where he was. Now, no clue! I’m a survivor of a mouse in the car. When my daughter was little and in he back in her car seat she said…”mommy there’s a mouse.” My husband said…a play mouse? and she said no a real mouse. I pulled to the side of the road and my husband and I got out of the car and left our kid in there! We opened all the doors and banged around. I didn’t want to get back in the car but we did. I was driving and my husband had his feet off the floor. He is scared of mice because his mom left him in the bathroom with one when he was a kid. We had a mouse in the car because we use to take our garbage to the dump. I’m sure your mouse is not in the car….no food. He was just thrill seeking! I’m shivering at your tales of mice in the car, Tanya! I’m right there with your husband, feet off the floor. I still wonder where he came from and where he went, but I guess the good thing is, he went! Thanks for sharing. Isn’t it funny how kids don’t seem to fret over things like this while we parents shriek and abandon ship?!! Would have freaked me out too! Did you ever find him again? I wonder how many of those “cute” little critters live under the hood or are caught unaware there when we drive off. I don’t want to think about that! I mean, there was no food in or out of my car, and we’ve had temps in the 90s, making the garage unbearable. 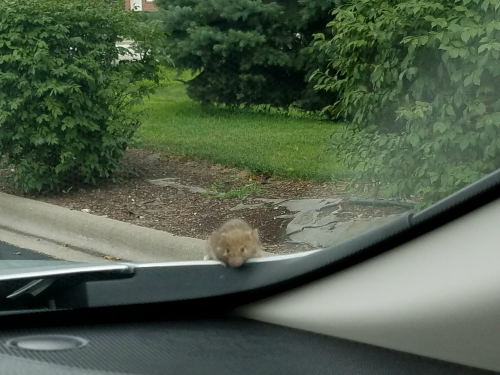 Why he decided to hitch-hike on my car is beyond me — but if he survived the trip, what stories he can tell to his fellow rodents!